Because it seems to me that right now, the most urgent task before us is to block Kavanaugh, I want to devote this issue of the newsletter entirely to why we need urgently to do that, and how it can be done. 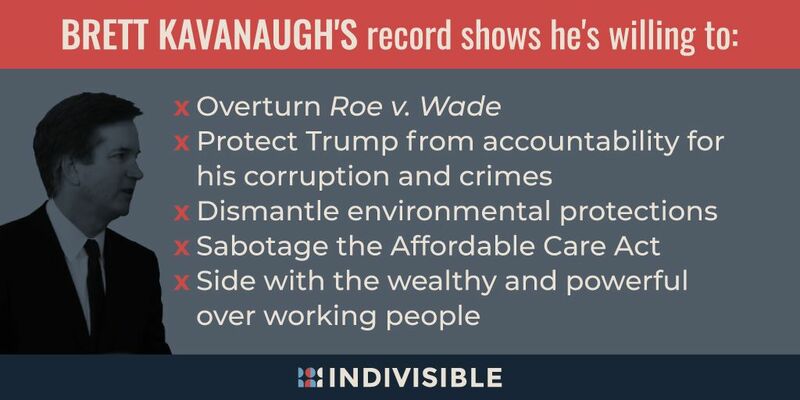 That is what Kavanaugh’s record shows. But here is the clincher: the National Archives lacks the capability to release all the thousands pages of his records to the Senate until early October. That’s how massive they are. But the hearing is scheduled for just after Labor Day, September 4. If that weren’t cause enough to delay this hearing until after the November elections, there are now 132 indictments so far, implicating Donald Trump in crimes and misdemeanors, some of them in violation of election rules. He must be defanged of his “presidency” before wreaking any more disaster on this nation. And of course, there’s the matter of the Republicans blocking Obama’s nomination to the Supreme Court, not to mention that the Donald has already taken his own swipe previously in that effort. Under the influence of Indivisible‘s post card campaign, I wrote 100 e-mail letters to the Senate yesterday. It ate up maybe one and a half hours of my time. Here’s how you can do it too, or if you are a person of busy consequence, you may want to confine your efforts to writing only to the seven wafflers in the Senate. Here’s the link to the five column spread sheet breaking the list down (left to right) into those who oppose the nomination (26) those who “lean” toward opposing it (18), the wafflers (7), those who tend to support (14) and those who support the nomination (34). Please click on the names of as many Senatorial aids as you wish, then copy the name. Paste it onto a blank e-mail, putting Sir: or Madam: (or if you can’t quite determine gender from the name) Sir or Madam: on the subject line. And finally, if you wish, copy/paste the letter you have generated for all, except the 26 true blue Senators, sign it, include your address, mention that you are a U.S. citizen, and send it off. Please forward this newsletter to all your lists. Send as many letters as you have time and conscience (and genuine alarm) to do. And, if you prefer, please at least consider writing to the 7 Senatorial wafflers. Allow me to remind you that Sandra Day O’Connor whose pivotal vote selected George Bush as an American President, some time later speculated she may have made a mistake. No one is infallible. For that reason it is critical for you to exercise extreme discretion in evaluating the next Supreme Court Justice, a nomination that may distort American Democracy for years to come. He will protect Trump from accountability for the crimes in which he is now implicated. 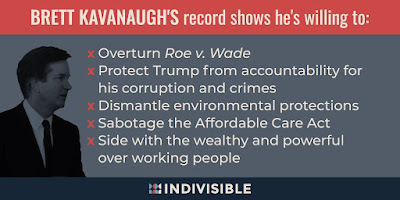 He will overturn Roe vs. Wade, guaranteeing that millions of American women will be forced into back alley abortions, resulting in many deaths, among them those of women with children, creating many orphans. He will dismantle what shredded environmental protections remain, guaranteeing that life on this planet has a limited time left to exist. He will sabotage the Affordable Care Act at a time when nearly 70% of Americans favor Medicare for All. He will side with people of wealth over the well being of working people, people on whom this country’s prosperity rests. Because I know you care about the well being of your country, I strongly urge you to do all in your power to reject his nomination. You are one of 26 Senators opposing the nomination to the Supreme Court of the United States Brett Kavanaugh. Between now, August 30 and the hearing slated for September 4, little time remains. My question is: why is Trump, who is now implicated in a total of 132 indictments, still empowered to nominate people like Kavanaugh to the bench? I urge you please to do all in your power to abort a nomination which will only intensify the Trump disaster that has already reduced our country to a laughing stock. He will overturn Roe vs. Wade, guaranteeing that millions of American women will be forced into back alley abortions, resulting in many deaths, among them a large proportion those of women with children, creating many orphans. He will dismantle what shredded environmental protections remain, this in the face of the Sixth Extinction, guaranteeing that life on this planet has a limited time left to exist. I urge you to aggressively horse trade with those Senators waffling over this critical nomination urging them to grow some spine: Donnelly, Heitkamp, Jones, McCaskill, Manchin, Collins, and Murkowski. Because you care about the well being of our country, I strongly urge you to do all in your power to reject his nomination. You will be considering a nomination proposed by a president implicated by a total of 132 indictments (so far), among them election law violation. Doesn’t this circumstance appear ever so slightly aberrant? Or is your hesitation a matter of maintaining parlor room decorum in the face of presidential high office, even if it happens to be occupied by a racketeer? There is also the matter of Republicans refusing to consider Obama’s nomination for the Supreme Court in an election year. Yet, 2018 is also an election year, one to whose consequences the Republicans imagine they are quite immune. I urge you to do all in your power to oppose a nomination that will drive the decisive coffin nail in the United States’ pretensions of remaining a democratic state. Should the Senate, flying in the face of popular sentiment, confirm this nomination, unpleasant surprises await in 2019. I strongly urge you to do all in your power to reject his nomination.